My parents recently completed a remodel of their master bedroom and bathroom. When it was done, they asked us over to come see it. When I took the tour, I noticed some interesting features that had not been there in the original layout of the house. I noticed that they installed a grab bar by the toilet and took out the tub and added a walk in shower. Like many seniors, or those on the verge of being seniors, my parents want to stay in their home as long as possible.1 My parents, while not yet needing adaptive devices, are taking measures to update their home to their projected needs. They are attempting to do what is referred to as aging-in-place. Aging-in-place is a term used to describe a senior living in the residence of their choice as they age, while being able to have services or other support they might need over time as their needs change, for as long as they are able. Aging-in-place is not for everyone. But, for those who think aging-in-place is a viable alternative the Internet is a fantastic resource on how to prepare. I did a quick search and found that the National Aging on Place Council (NAIPC and National Association of Home Builders (NAHB) have several resources to help seniors age in place in their home. NAIPC’s website3 has resources from finding service providers to practical advice on aging-in-place while NAHB’s website4 has several resources for remodeling your home for aging. Whatever is decided, whether aging-in-place or relocating as an individual ages, I think it is important to remember that the goal is to maintain and/or improve one’s quality of life wherever home may be. Sabia, Joseph J. (2008). There’s No Place Like Home A Hazard Model Analysis of Aging in Place Among Older Homeowners in the PSID. Research on Aging , 30(1), 3-35. 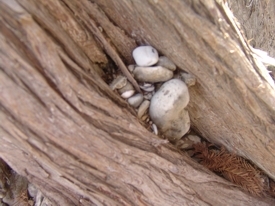 Rocks in the roots of a cypress tree along the Blanco River. Photograph by Marvin Niebuhr, ©2010.